Beijing, China: September 6, 2012— The upcoming esProc, an innovative desktop BI software, will be launched soon within this month. According to Raqsoft, the industry leading desktop BI software provider, this product features with ease of use. esProc provides a grid user interface similar to Excel which enables users to perform codes in a grid from left to right and top to bottom. This way of operation conforms to users’ thinking mode and reduces the difficulty to learn. Besides, the cell-style code not only makes the code neat and clean, but also offers users a visual way to organize and arrange the relationship between the computation steps, and thus easier to pierce the heart of a problem and solve complicated problems. What’s more, the agile expression of esProc is simple but with rich information. Users without highly skilled SQL experience can analyze data easily. The step by step data computation feature of esProc is ideal for users to solve complex business data computation and analytics. With “.” for generic object reference in esProc, the desktop BI software, this expression is more straightforward and easy to understand, allowing users to conveniently organize the relationship between data from business perspective. It’s known to all that when the table number grows, the complexity of SQL relational query will come into a geometric growth. While with object reference function of esProc, users can easy to access to data since this function transforms complex & lengthy statement of multi-join into simple object access. In addition, the computing complexity on a set related data analytics can be greatly simplified with complete set-lizing of esProc. esProc sets are ubiquitous and the members can be of any data type or another set. 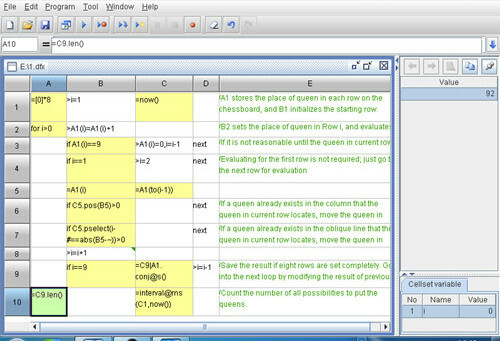 Complete set-lizing converts cumbersome and difficult lower-level computation into high-level set operations, for example, the intersection, union and complement, enabling users to solve business data analytics problems in a simpler and easier way.